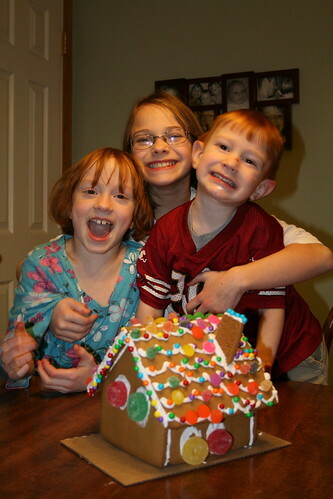 We were a little late in decorating our gingerbread house this holiday season. Oh well. We were a little busy with other things. I finally got around to getting it ready on Sunday afternoon. (Yes, we are back to early church. Hooray!!!) The kids really had fun decorating it and then destroying it as they ate it. No sense in letting it sit around gathering dust, right? Here is a picture of the artists and here's a link to the rest of the pictures. Enjoy! A no-chocolate gingerbread house? I'm disappointed. I have a guess as to whose influence that was. It's pretty cute, nonetheless! Oh no you didn't! I played no part in this gingerbread house planning. Now when you see a gingerbread house made totally out of candy(the good, name brand type) with no gingerbread at all, then you will know who influenced that one. The house came as a kit and I didn't add any extra to it. The house and candy weren't that great to eat. Maybe next year we'll do graham cracker ones instead. Then the kids can each do their own and I'm sure there will be lots of chocolate. I can imagine Mickey's house right now. It's made of laffy taffy, smarties, nerds, and other Willy Wonka products. You'll have to give that a try, Sweetie.